It was hot. It was loud. It was long. And it was fantastic. 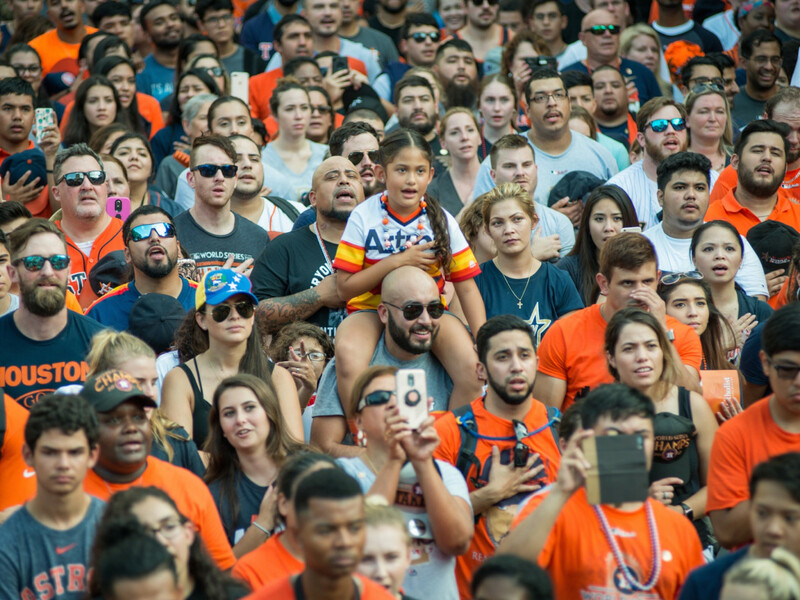 For the estimated 1 million fans who turned out to salute the Houston Astros for their World Series win, it was a once-in-a-lifetime experience. 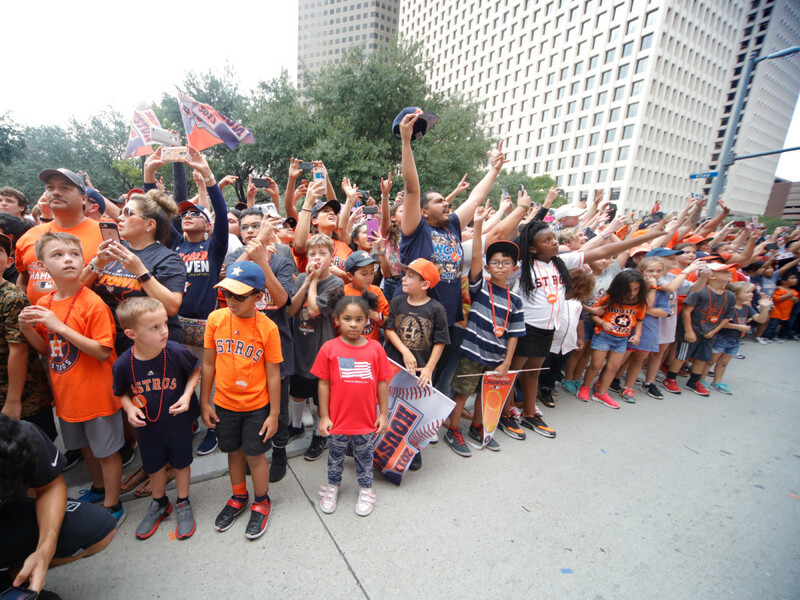 The parade and rally in downtown Houston Friday was a chance for fans to demonstrate how much they love this team. And it was an opportunity for the player, coaches, and staff to bask in the glory of a job well done. 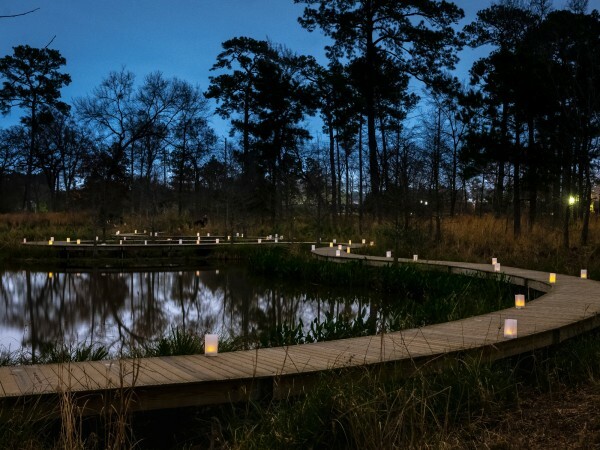 Photographers F. Carter Smith and Jacob Power captured the glorious day that many Houstonians will remember forever. 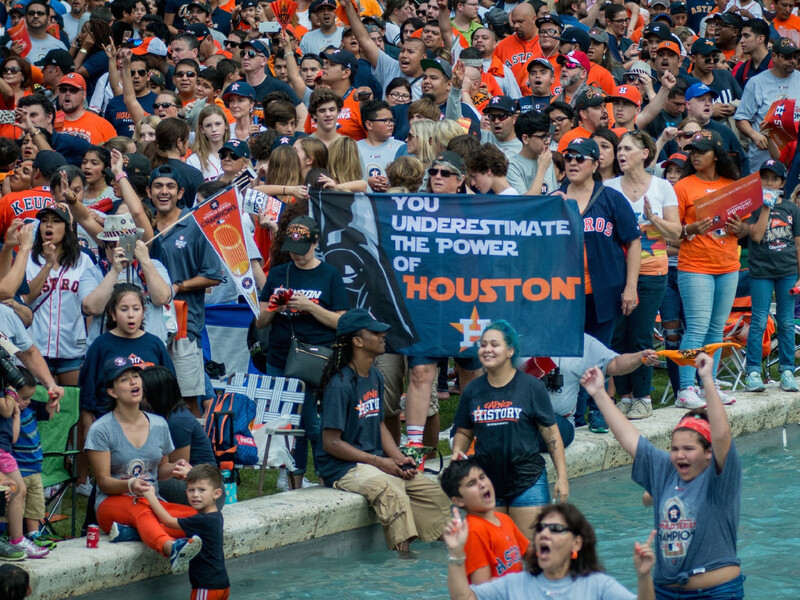 Fans filled every bit of Hermann Square around the reflecting pool at Houston City Hall for a rally that followed the parade. 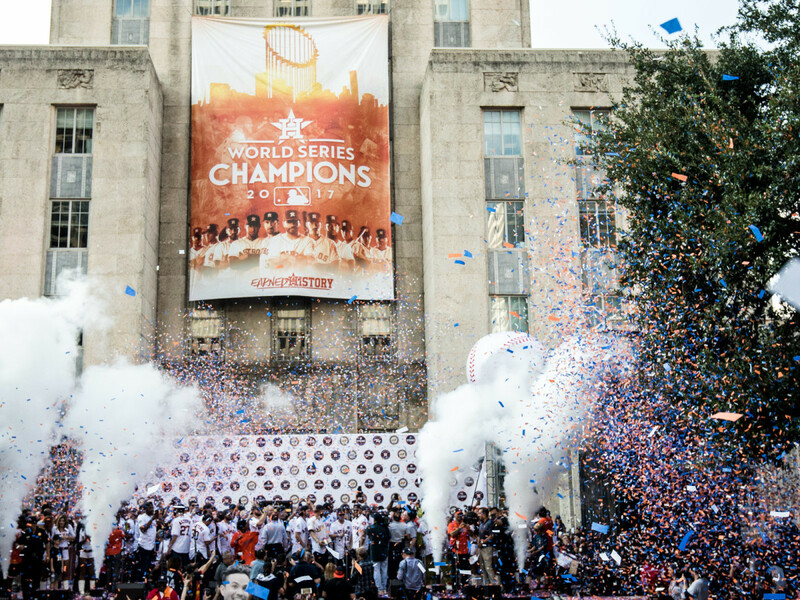 World Series MVP George Springer hoists the World Series trophy for those along the parade route to admire. Like a lot of Houstonians, CultureMap associate editor Marcy de Luna and I decided to take public transportation to get downtown. We thought we had allocated plenty of time as we waited for a bus on lower Westheimer two hours before the scheduled start time of the parade. But as a bus passed the stop without slowing down because it was at capacity, we knew we had to rethink our plans. I phoned my husband, who picked us up and drove us to Dallas and Taft, where traffic was at a standstill. We got out of the car and walked the rest of the way. 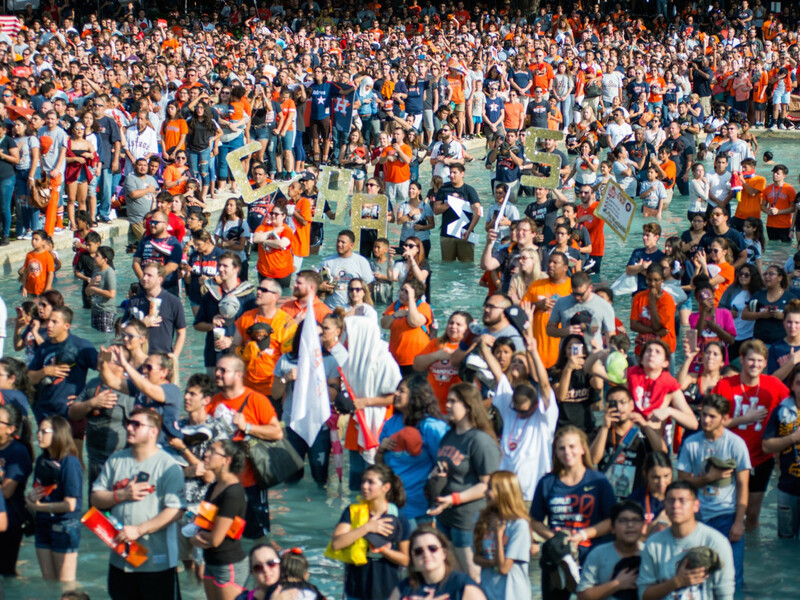 We were fortunate, as we heard tales of thousands who were stranded at NRG Park because the crowds were so enormous. 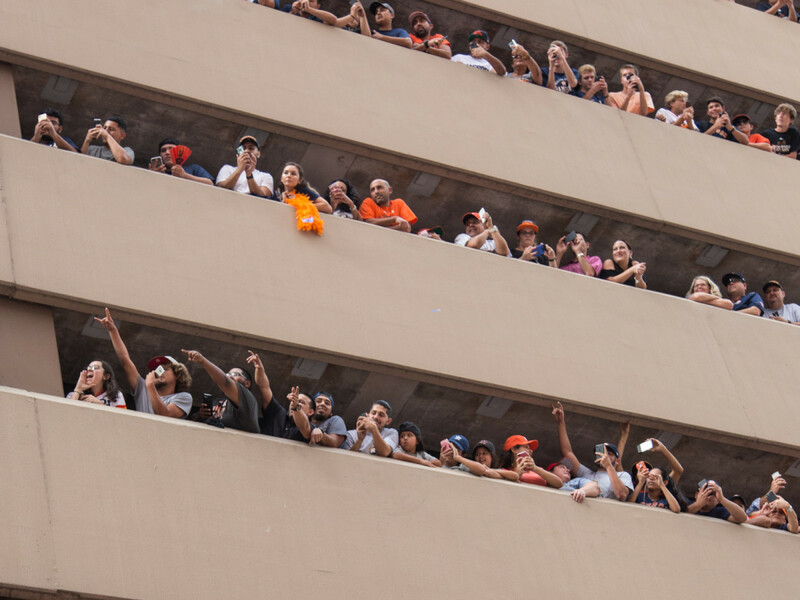 Pictured here, parking garages in downtown Houston proved to be popular perches for parade watching. 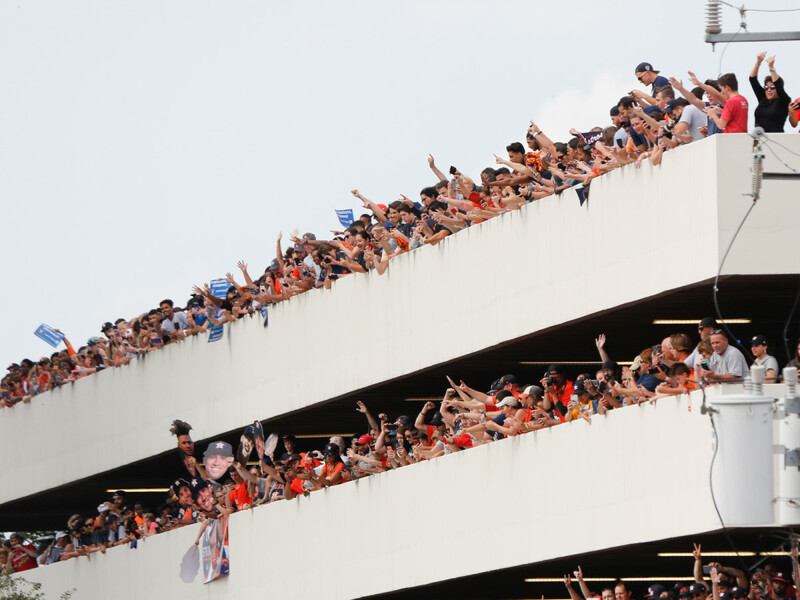 Just about every parking garage on the parade route was filled to capacity with cars — and bodies. Despite the crowds, everyone seemed to be in a festive mood. Because of the expected large crowds, the parade route was expanded at the last minute. 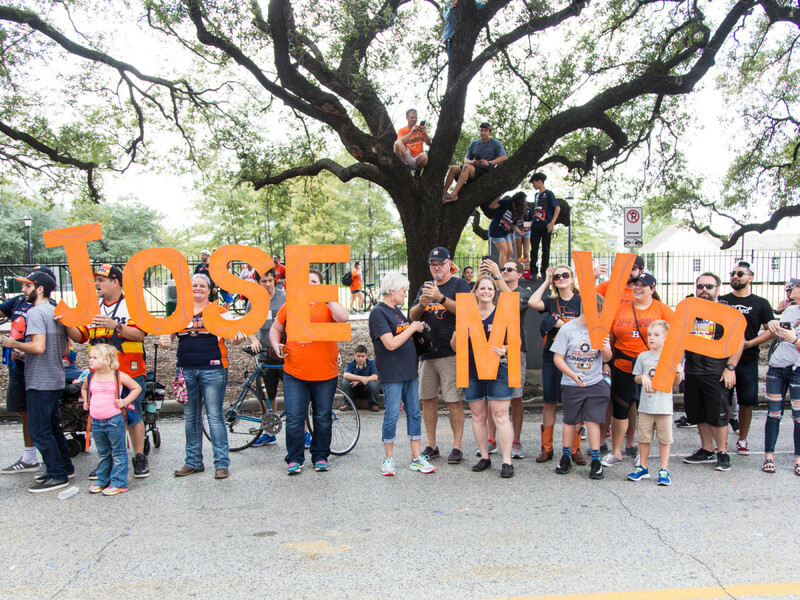 It began at a staging area at Bagby and McKinney streets, where three large fire trucks and an emergency rescue vehicle awaited the Astros players, coaches, and staff who arrived in buses. 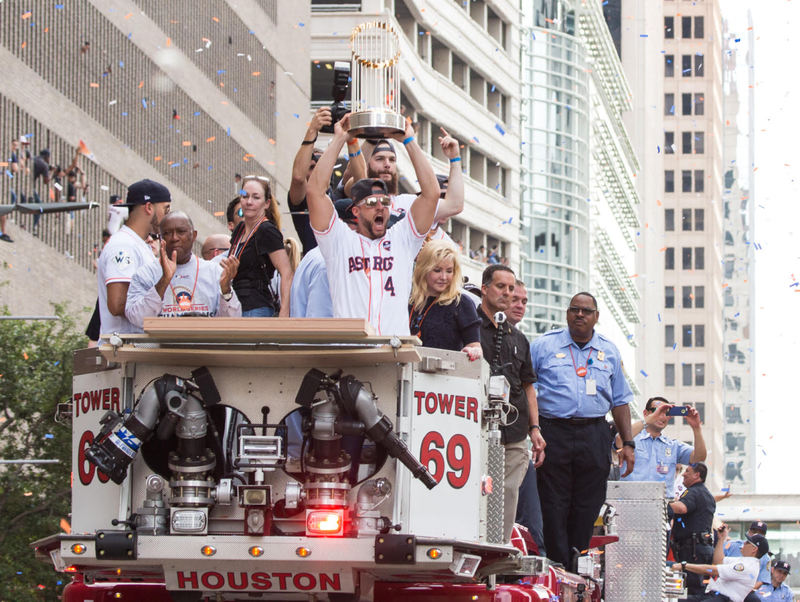 George Springer and Carlos Correa joined Mayor Sylvester Turner atop the first fire truck, along with Astros owner Jim Crane, his wife Whitney, and their young son. 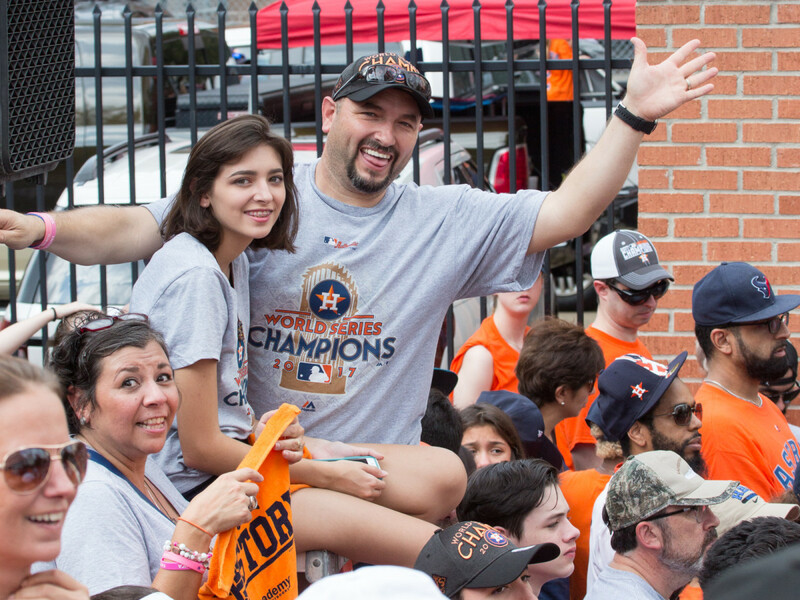 There were also two double decker buses for friends and family, although a number of players, including Jose Altuve and Yuli Gurriel, as well as coach A.J. Hinch, hopped on one of the buses for the parade. 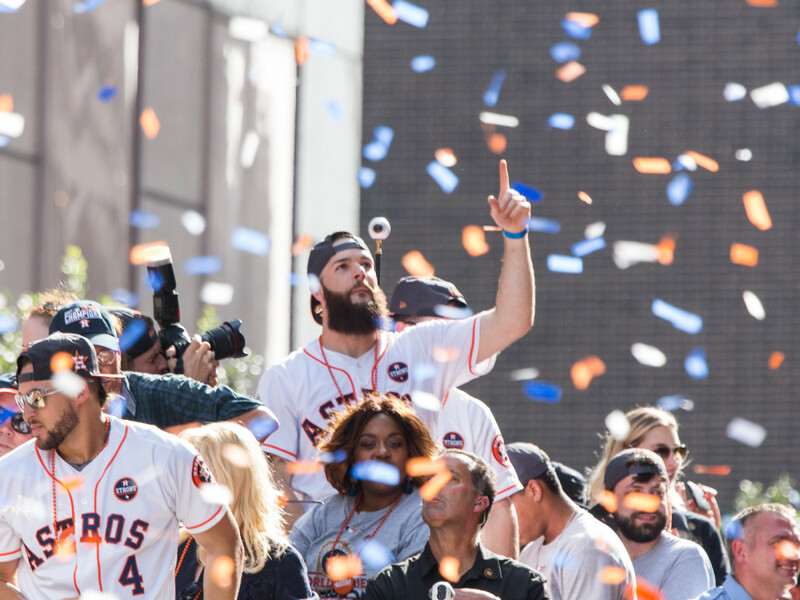 Astros pitcher Dallas Keuchel and other players were showered with confetti on the route. 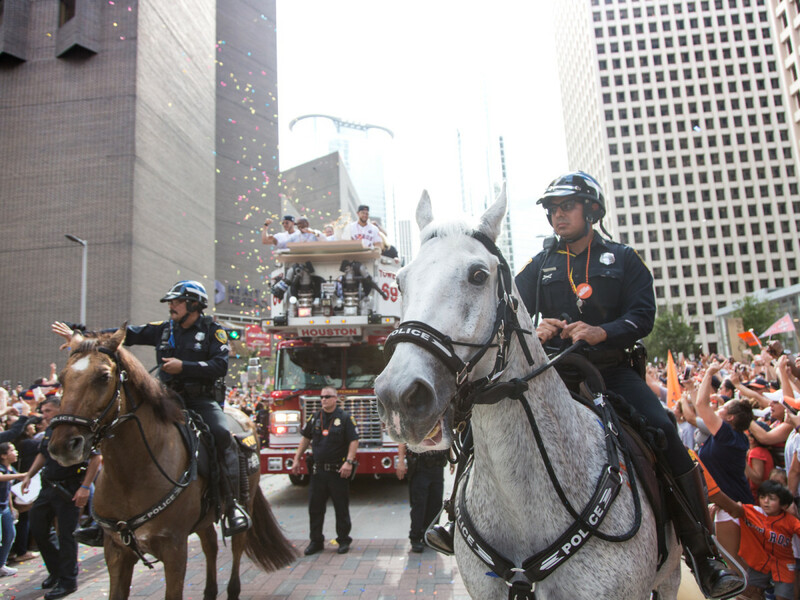 In a nice nod to the Astros history, such former stars as Jose Cruz, Craig Biggio, and Jeff Bagwell rode togther atop the emergency rescue vehicle. 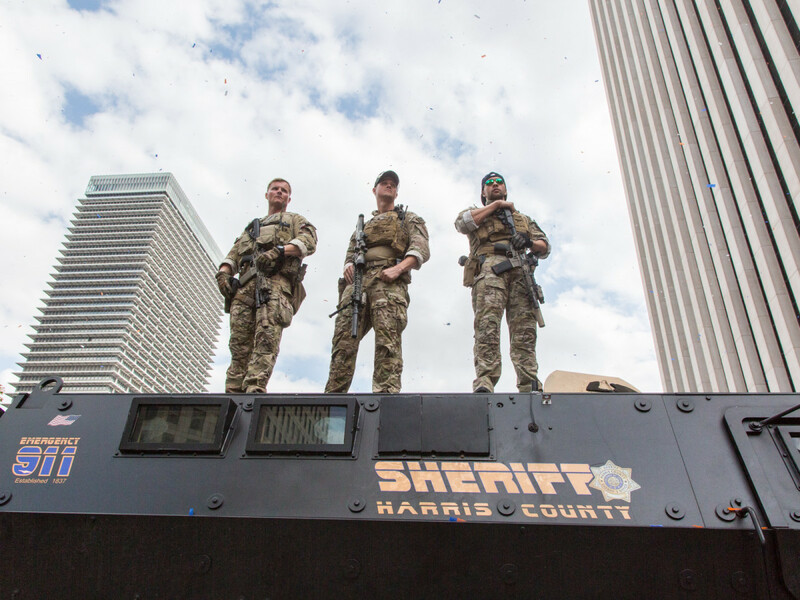 Because of the recent terrorist attack in New York, there was heightened security along the parade route. But spirits were high as the large crowd enjoyed the celebration. All along the parade route, crowds extended several feet deep. Many chanted "Let's Go Astros!" as the team went by on several fire trucks and double decker buses. 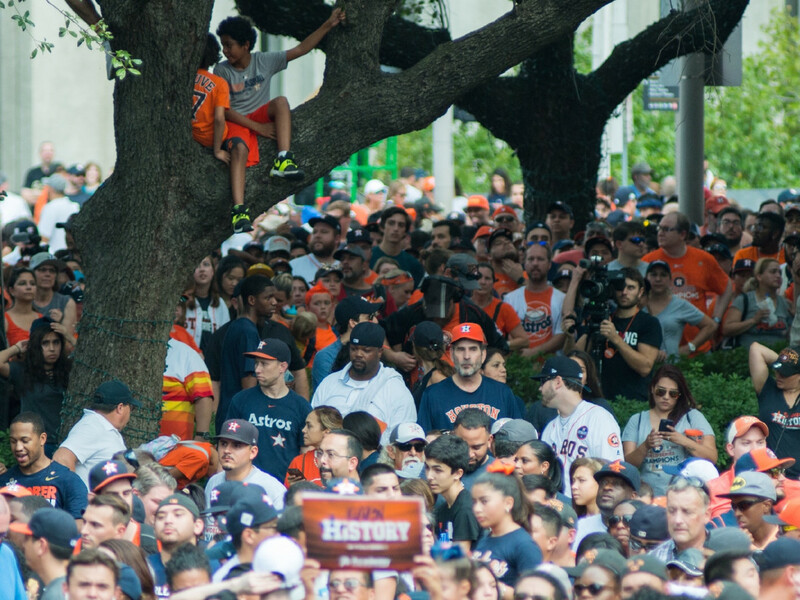 Later, in front of Houston City Hall, the crowd grew impatient at the long wait for the rally honoring the team to begin, so they started chanting, "We Want Astros!" What's the best place to be at the parade? Atop dad's shoulders. Many kids at the parade were lifted up by their parents to get a better view of the action. Some industrious kids — and a few adults — climbed the hearty oak trees to get in position to see their favorite Astro. Most popular Astro? It seemed to be a three-way tie between Jose Altuve, Carlos Correa, and George Springer, with Altuve in a narrow lead. 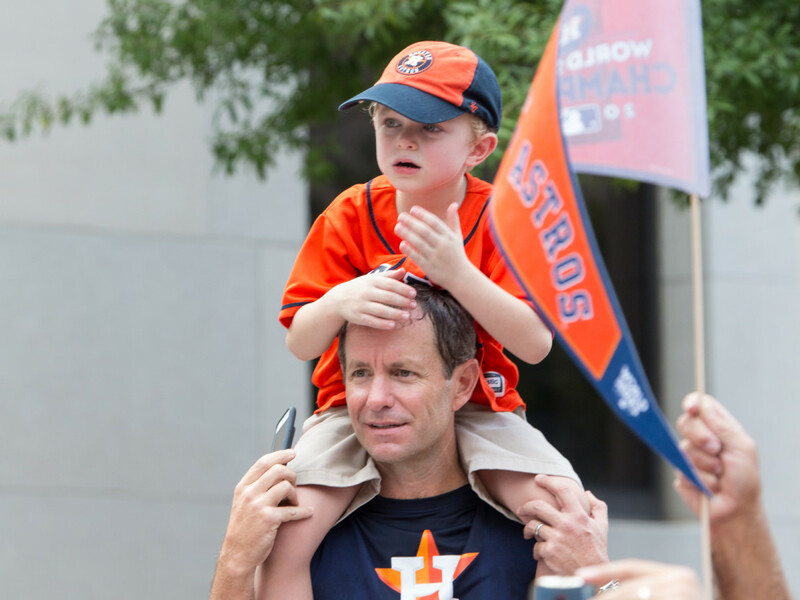 At a rally at Houston City Hall after the parade, head coach A.J. 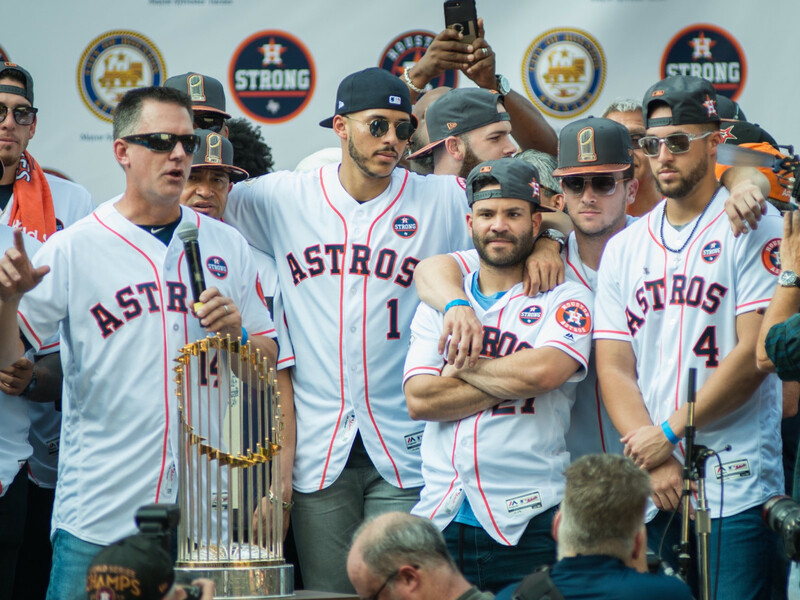 Hinch thanked the crowd while George Springer, Jose Altuve, Alex Bregman, and George Springer looked on. 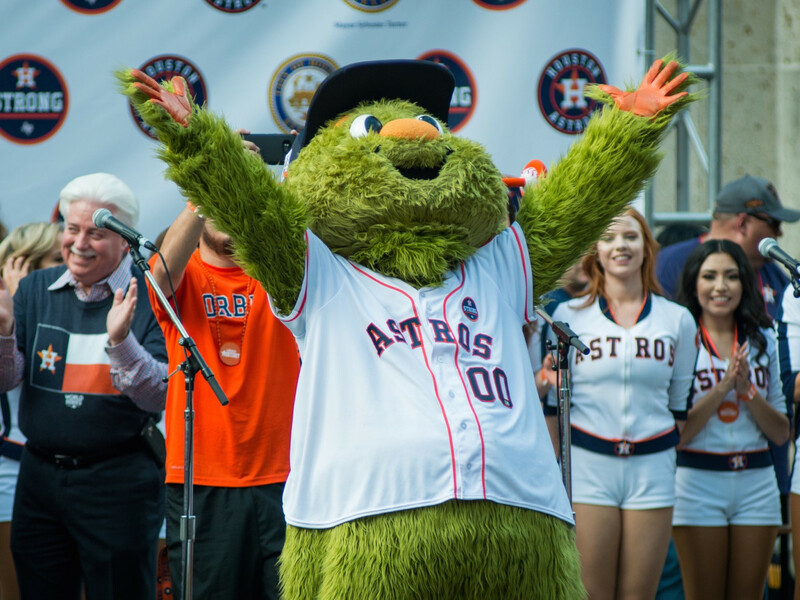 Orbit, the Astros mascot, kept spirits high, although I worried about his heavy costume on the unusually hot November day. A woman a few feet from me in front of City Hall fainted, and there were several other such reported incidences. 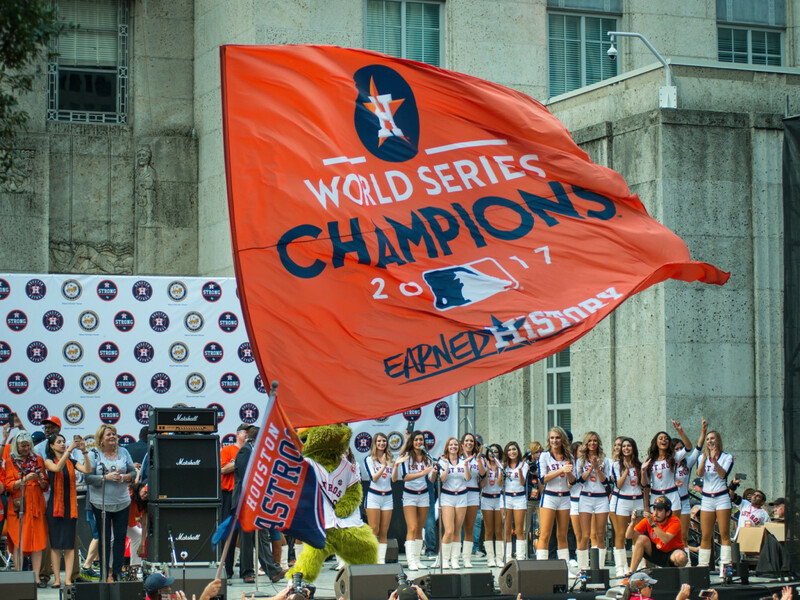 Orbit also got his cardio count up by racing around the stage with gigantic orange flag touting the Astros as World Series champions. Because of the heat, the reflecting pool in front of Houston City Hall was enticing. The large crowd solemnly sang The Star Spangeled Banner. But they didn't seem much into politics. They booed Governor Greg Abbot, Lt. 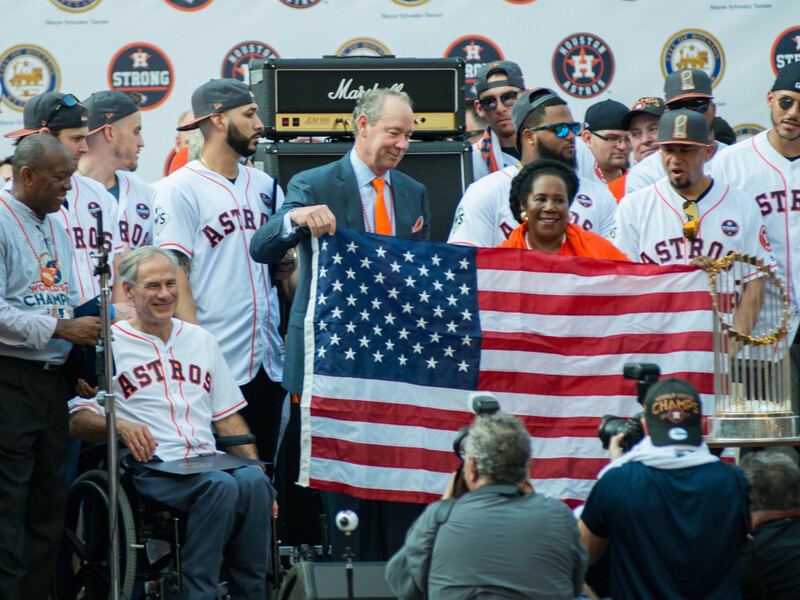 Governor Dan Patrick, Senator Ted Cruz, and U.S. Representative Sheila Jackson Lee, although when Lee presented Astros owner Jim Crane with an American flag that had flown over the U.S. Capitol, they cheered. And Abbott got a few laughs when he presented a form "signed by the Governor of Texas" excusing attendees from missing work, school, or errands to attend the parade and rally. 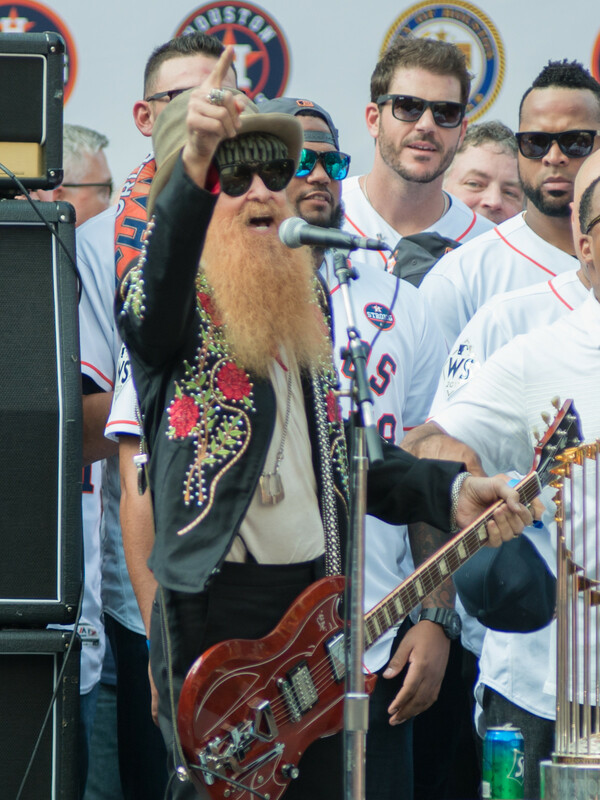 ZZ Top guitarist and lead singer Billy Gibbons was a suprise guest. He strummed cords to the national anthem, and later closed the show with Whole Lotta Love. 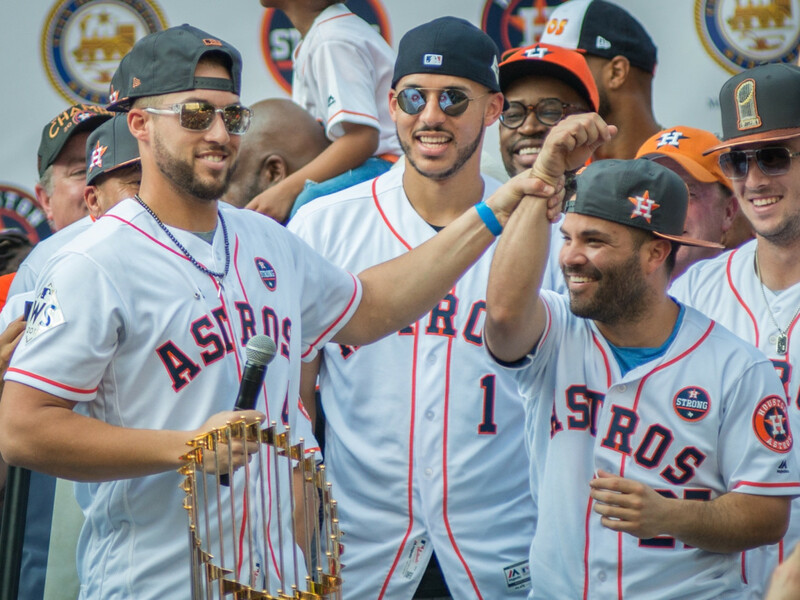 World Series MVP George Springer, left, touted Jose Altuve for the season's MVP, and the crowd loudly agreed. 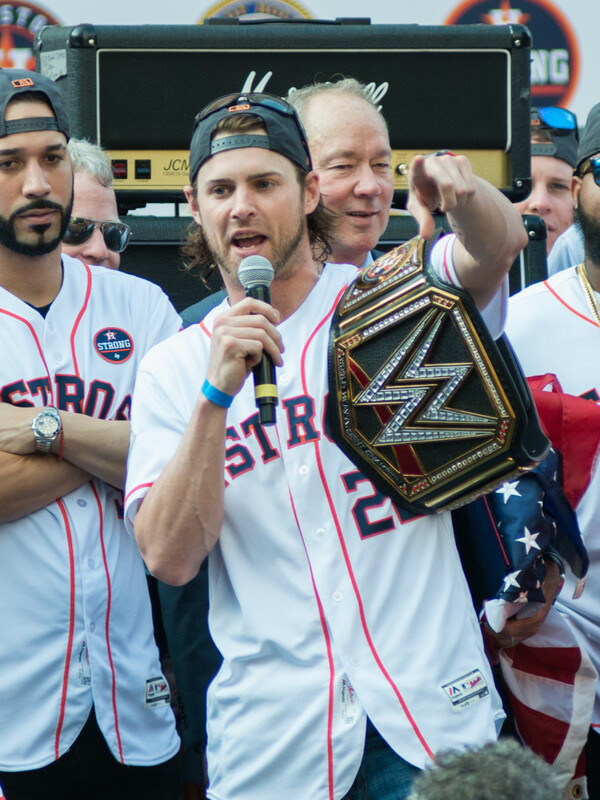 Astros right fielder Josh Reddick channeled his idol, World Wrestling Association great Ric Flair. 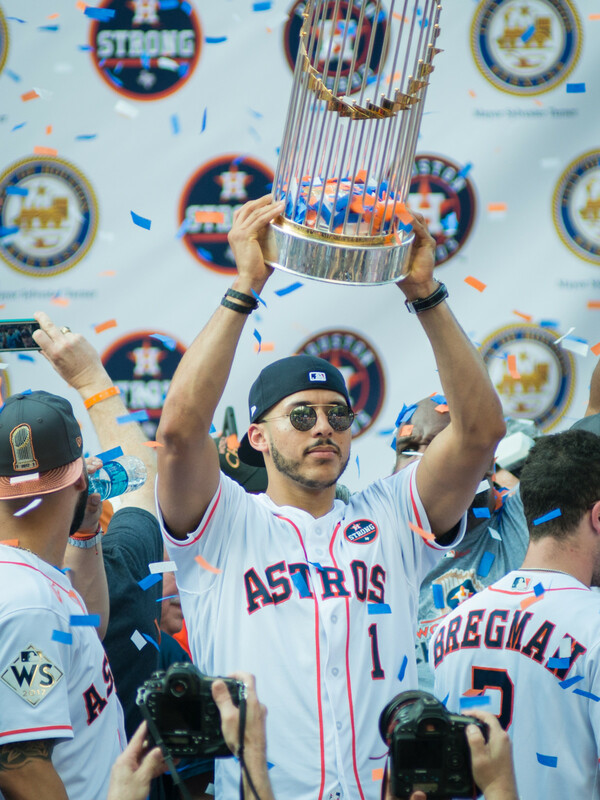 World Series MVP George Springer thanked "every person in the state of Texas" for believing in the Astros, particularly in Game 7 of the ALCS against the Yankees and Game 7 of the World Series against the Dodgers. 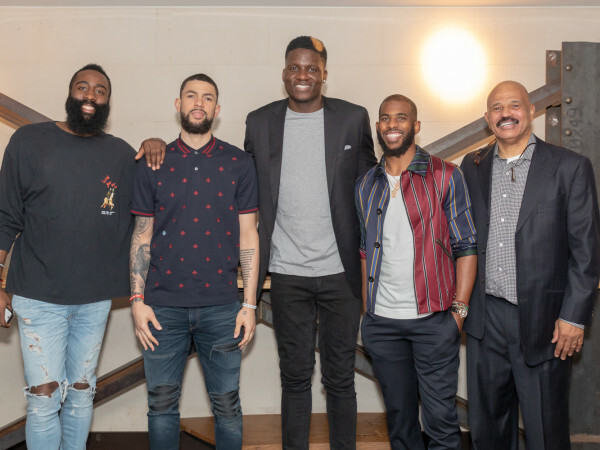 "Houston, we have a championship team and nobody can take that away from us," he said. The long day ended with bursts of smoke and confetti. 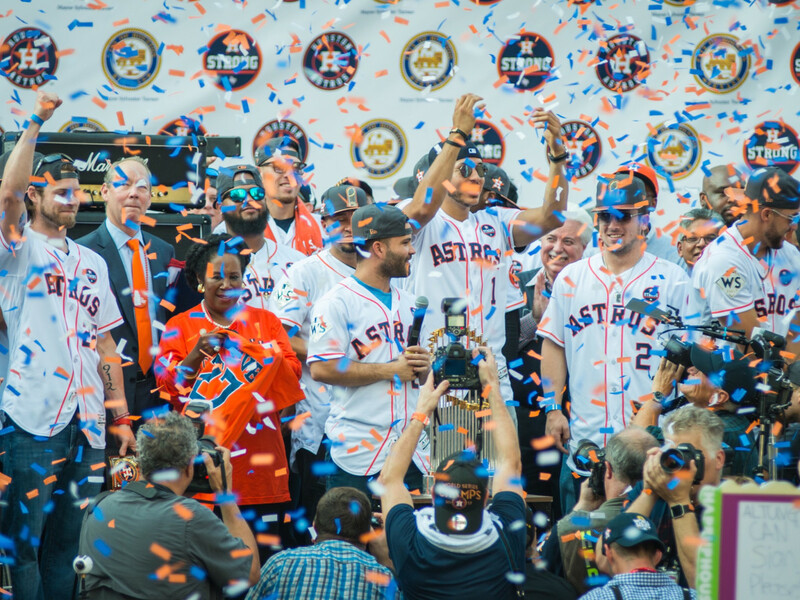 As the confetti rained down, Jose Altuve had the last word. 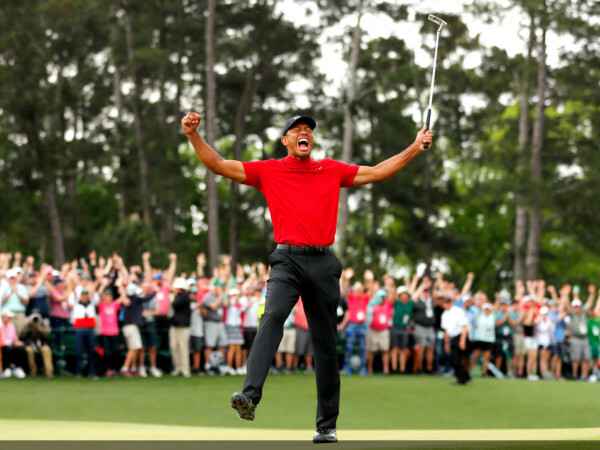 "We are champions," he said.